For the past 18 weeks I have had two main focuses: working as an actor and preparing to run the Philadelphia Marathon. I had never run a marathon before, and I had the ambitious goal of attempting to qualify for the Boston Marathon – the king of all marathons. For my age group, I had to run a 3:40:00 marathon, an 8:23 pace. Having this be my first marathon, I honestly didn’t know what to expect from myself. I didn’t know what kind of natural ability I did or didn’t have, whether I would be healthy, or whether I could power through all 26.2 miles. So many factors affect the performance of an athlete. I simply didn’t know what level of success I was capable of – if any! Starting in July, I had trained hard, and followed a training schedule to insure I’d run a great race with minimal risk of injury. The 18 weeks I trained were not easy. Some days were fun, and I felt like a warrior on my feet. I felt fast and unstoppable. Other days I struggled to run, was injured, or mentally couldn’t power through. I had to take a couple of weeks off during my training because of shin splint and planter fasciitus pain. Throw in the crazy film schedule I juggle (sometimes 12+ hour days), and I could have been setting myself up for disaster. However, I really love to run and really wanted to qualify for Boston. I made it a priority. I missed dozens upon dozens of parties, dinners with friends, outings, and social opportunities to train. Long runs consumed my weekends, along with sleep and recovery. When I wasn’t running, I was reading about running while on set. I focused on eating healthy – and plenty of calories. I consumed more pints of Ben and Jerry’s Ice Cream than I care to admit. I focused on refueling myself as a runner. Sometime in the last 18 months I transformed from a recreational runner to an athlete. After having gone through my training and marathon experience, I can honestly say that the race itself was one of the best days of my life. When you love running as much as I do, and the hard work pays off (in front of hundreds of screaming fans), it’s the best feeling in the world. I qualified for Boston, and spanked my goal! I ran the marathon in 3:32:33, an 8:02 pace. It’s amazing to me that my mind, body, and legs delivered above and beyond what I required of them. Two days after the race, it still blows my mind. While I was confident in myself and believed in my training, you never know what will happen at a race until you are there and doing it. But I learned more from my marathon experience about myself than that I’m an athlete. I learned that I am an incredibly strong and determined young lady, and a FIGHTER. When the going got tough, I powered through. I didn’t know I was capable of that. I didn’t really get to know myself until I went through marathon training. Friends, you are capable of anything you put your mind to. Do yourself a favor and LIVE! Challenge yourself to try something new and scary. You will amaze yourself. Furthermore, I know see myself differently as an actor, model, and human being. I have already proved to myself that I am capable of something that very few people get to accomplish. This gives me new confidence in myself. It also gives me confidence in the people around me. If I can run a marathon the way I did, than we are all capable of things we don’t think we can achieve. All we have to do is dig in our heels, and fight without fear of failure or rejection for what it is we want. My view of the human race has completely transformed. As for my running career, I am excited to see how much I can improve! 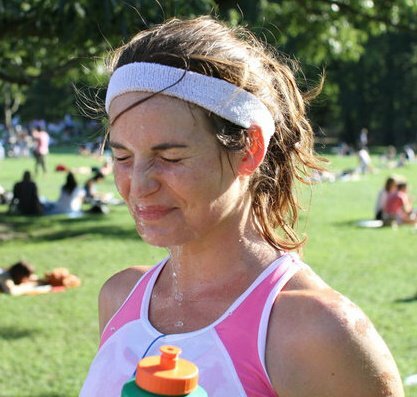 I will most likely never be an elite runner, and I’m okay with that. However, I am confident that I can get stronger and faster, and curious to see what results I can accomplish. I have already registered for two marathons for early 2011 – the Surf City Marathon (in Southern California) in February, and the Shamrock Marathon (in Virginia Beach) in March. I am going to ring in 2011 with a New Years Eve race in Central Park. PS- actual race photos to come! ~ by Elizabeth on November 23, 2010. Such an awesome blog post, I am so happy for you!